And on Saturday just gone, as my darling husband knew I was having my R&R weekend (rest and relaxation!!) he brought me back this months Instyle magazine, which had a lovely freebie-an Elizabeth Hurley tote bag!! I love it, as it rocks the stripe trend-I've been using for work everyday since I got it!! That dress looks fabulous on you. Hi Wendy! Thanks so much, thats lovely of you! That dress IS pretty on you. I love the idea of stripes for the summer. Hi fabulously broke-thanks so much-I look forward to seeing that!! cool stripes! love your outfit. Love your dress! I'm adding you now! I'm also obsessed with everything striped! It adds such a summery vibe to everything and not only is that a great dress of yours, but your shoes are also killer! I Love stripes too! :) I have been trying to get a stripes dress & yours is awesome & you look so good :D I love it. Love the stripes! I think this trend is so classic (is that an oxymoron? A classic trend?). That dress looks great on you! Very cute!Stripes are definitely in! you look fantastic!! there must be synchronicity in the air - i thrifted a b/w stripey top today and am planning to wear it tomorrow! i wear a bandeau dress, and so do you. Even up to a year or so ago I didn't like stripes, and now I can't get enough of them! Love the dress! evry summer i get a sailor itch and have to wear stripes too! This dress is so fresh and summery, and you are wearing it perfectly, my dear Sharon! Hi Sharon, i love this striped post, French Connection (this brand isn't sold in Italy) and your pretty dress too, so love dressed by you. Thank you so much Sharon for everything you wrote for me, is so kind of you! You look amazing in that dress! Thats so sweet of your husband! I am sucker for good men. I'm all about the stripes! You look great! I love stripes. 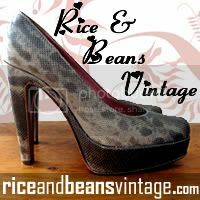 Hi rice and beans vintage-thanks a lot and I've added you too! Hi cupcakes and cashmere-Yes I do love stripes-thanks a lot! I love theses shoes too, as they're really comfy!! Hi yiqin-thanks very much-hope you find one soon!! Hi asiancajuns! Yes stripes are great for summer and such a classic-thanks very much!! 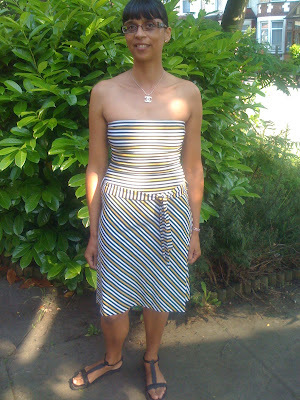 Hi fashionable obsessions-yes, I agree-stripes are lovely for summer! Hi karima-thanks a lot-look forward to seeing your top too!! Hi fashion chalet-see, great minds think alike!! Will love to see your shoes too! Hi Nic-yes, its a great trend to get into for summer! thanks!! Hi Ida-you're so lovely-thanks so much-yes, hubby is soo lovely-ha ha!! 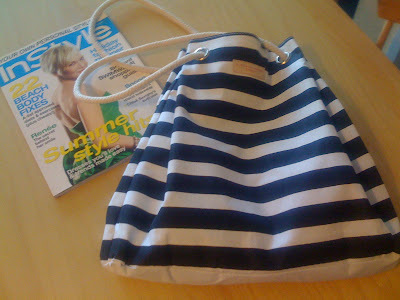 Hi fashionpuppy-Yes I do love the bag and stripes are perfect for this summer-thanks!! Hi alice-thanks so much!! Hope your blog sorts itself out too!! Hi Silje-thanks a lot!yes, we are lucky to have such sweet husbands-ha ha!! Hi saray-yes I'm loving stripes for summer-thanks so much!! Hey secretista-thanks so much-stripes rock-ha ha!! Hi nv-thanks for stopping by again-I'm adding you too!! I want thatHurley bag - better find Instyle today.. great H&M dress.. looks fab! Yes, i love stripes, it is even better when they are faded and sea-worn! 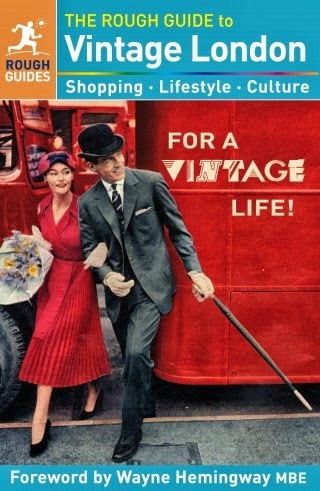 I like your blog and your style! It is such a chic and sweet dress! I don't see yellow straps often, but it looks great, a bit unusal than the normal black and wite one! The shape looks very romantic and skinny tie-belt around the waist is so great! Dear, you look fabulous! hi sharon! i'm totally in love with that hoss intropia shirt, i already saw it in OK! i like your necklace! is it chanel? Hi ladies who lunch-thanks a lot and hope you manage to grab your copy!! 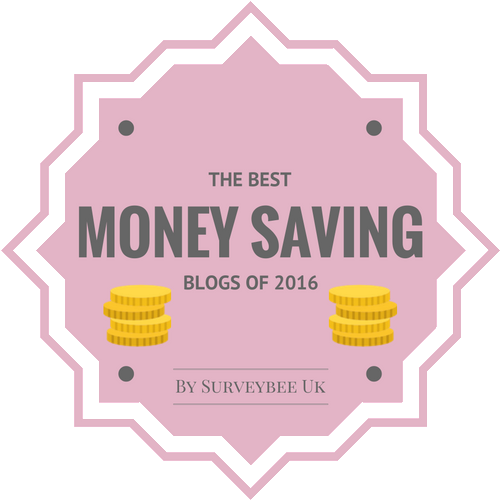 Hi ruby may-thanks so much for your lovely comment and dropping by my blog!! Hi times of glory-thats really lovely of you-thanks so much!! gimme MORE stripes!! i love them!! :) u look really nice here! Again - I need to know how to get your fab body! Hi pammish-thanks so much!! Yes I'm loving the stripes too! Hi kate-believe me, I should be doing any exercise-I badly need to tone my thighs!! Hi brandi stone-thanks for stopping by my blog and thanks so much!! You look so good in that dress! I love the fact that it's strapless so the stripes aren't overpowering. I think that bag is great too! Hi Danz-thanks so much-it is a change to have a strapless dress!! I like a lot striped dresses! You look so cute in that one! Hi alice pleasance-thanks, yes a great summer trend!! I got my copy today and my free bag - you're right it is the most handy size - I love it.. will use it loads..
Hi ladies who lunch-yay! Thats great, it is such a handy stylish bag-glad you got yours! !